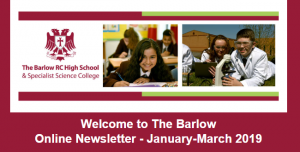 The Barlow RC High School is a leading Catholic High School in the Roman Catholic Diocese of Salford. We believe in providing an outstanding education for all our students. We do this through our commitment to high quality teaching and a relentless pursuit of academic excellence, delivered by highly qualified specialist practitioners, in a welcoming and supportive educational environment. We provide a broad and balanced educational experience for all, which motivates and inspires our young people to progress in learning, develop their talents and achieve success in life. At the Barlow we set high standards for our young people. We have high expectations both academically and in terms of behaviour and uniform and we instil in our students the importance of fairness, in which, individual dignity is upheld and respected and we nurture our young people to be proud of promoting our Christian values of service, prayer, achievement and respect for all. Our dedicated staff are totally committed to working to ensure that every child in our care is happy and safe, enjoys their education and achieves their full potential. If you are a parent looking for an excellent school for your child, I hope that what you read here encourages you to find out more about our school. We are proud of our school and welcome visitors and these can be arranged by contacting our school office.